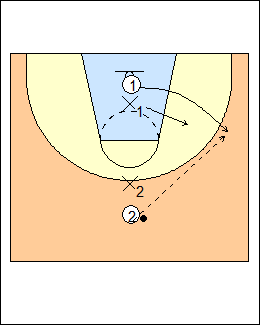 Attacker 1 sprints to the rim and exits to either wing, it's live on the first movement. Option - allow the first pass before going live. 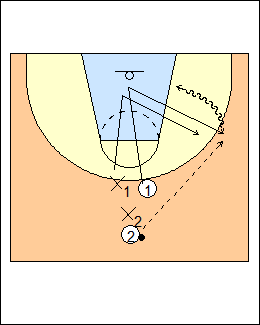 (2 should shorten the pass with one dribble, and pass with the outside hand). See 1 on 1 - Florida finishing, Ryan Goodson, Shooting - Borg. 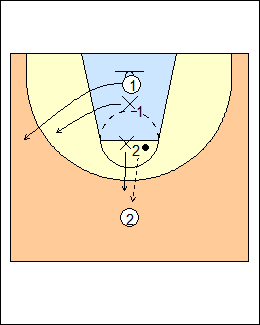 1 starts under the basket, X1 is facing the ball. See Attack/defend - Pasquali 3 on 3 advantage. 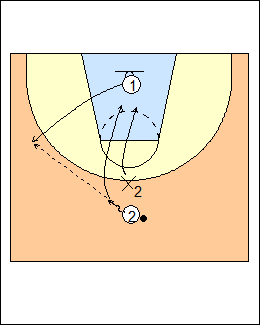 X1 faces 1 (more difficult for the attacker to get open), X2 passes to 2 from the foul line. No defender on 1, 2 tries to give and go in front of or behind X2.